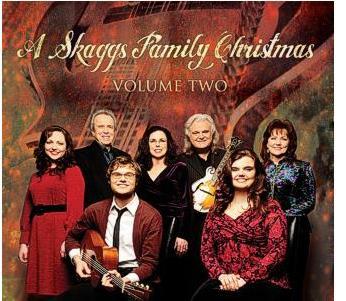 Nashville, TN(December 6, 2011) -- A Skaggs Family Christmas Live comes to RFD-TV for airings December 8 and 9. The hour-long extravaganza features Ricky, his wife Sharon, and their children Luke and Molly, and includes Buck and Cheryl White and Cheryl's daughter Rachel Leftwich. Also performing is Ricky's band Kentucky Thunder along with Jim Gray and the Nashville Session Players. The troupe treats fans to traditional holiday favorites as well as new songs that are sure to become seasonal standards. The special is the perfect accompaniment to a warm fire, sweet eggnog and yuletide cheer. Fourteen-time Grammy winner Ricky Skaggs marshals the members of his gifted family as well as his in-laws, the bluegrass masters the White Family, to make this holiday season a family affair. Performing his favorite bluegrass, popular holiday carols will be rediscovered, with renditions of "Little Drummer Boy," "What Child is This?," "The Christmas Guest," "Have Yourself a Merry Little Christmas" and more. The tour starts at the Brooks Theatre in Clemson, SC on November 28th and runs through December 22nd in Nashville, Tennessee at the Schermerhorn Symphony Center. Tickets are now available. Complete tour is listed below. North Bethesda, MD -- Strathmore brings the 10 Days of Christmas to Washington, D.C. with a collection of events that will make December flush with the sounds of the holiday season. Fourteen-time Grammy winner Ricky Skaggs marshals the members of his gifted family as well as his in-laws, the bluegrass masters the White Family, to make this holiday season a family affair. Imbued with the pure mountain sound of bluegrass, popular holiday carols will be rediscovered, with renditions of "Little Drummer Boy," "What Child is This?," "The Christmas Guest," "Have Yourself a Merry Little Christmas" and more. Nashville, TN -- One of Billboard's most-anticipated Country albums of the fall, A Skaggs Family Christmas Volume Two, will be available in stores nationwide next Tuesday, September 27. The new, 10-song CD features both studio and live recordings, and includes performances of traditional seasonal favorites and new compositions that are sure to become holiday treasures.